Some think growing up on Martha’s Vineyard is a ticket to easy street, nothing but day after day at the beach, chilling like a tourist all year round. But anyone who lives here knows this is not the case. Not only is making a living hard on an Island with distinct borders, making a name for yourself off-Island can be harder still. 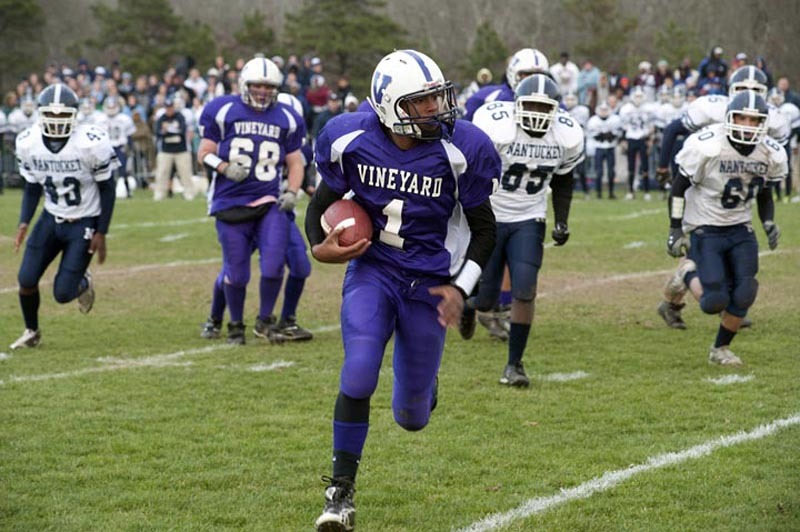 Randall Jette knew this when he made the leap from star football player on the Vineyard to the division one program at the University of Massachusetts. Not a huge player (5 feet, 11 inches, 193 pounds), not from some big-name athletic school (go Purple), not even on a lot of people’s radars at first, Jette always knew he had something to prove. The Jette stream, as he was known in high school, knew he had to fly higher and faster than his peers. But that was okay with him because it provided him with more fuel to go the distance, all the way to the National Football League, it turns out. Last weekend Randall Jette signed with the Green Bay Packers. In high school, Jette played a number of positions, wide receiver, quarterback, safety. In college he became a defensive specialist at cornerback, usually defending the best receiver on the opposing team. But in any position he was a coach’s dream: a quick learner and a hard worker.